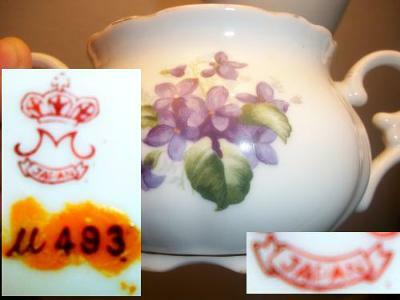 'M' With Crown Japan Pottery mark Query:- I have a some china. The mark is a crown with 3 panels, and a cross on the top. The letter "M" is underneath that. The M has a curl on the beginning and end of the "M" and beneath that is "Japan" written in a banner. I'm just wondering who the maker is and where I can find more information about this set of china. I can't find this exact mark in my books, but it would be typical for the Noritake company to use an M with a crown. They have been recorded to have over 400 marks, many of them variations of the M for Morimura (the family name of the founders). 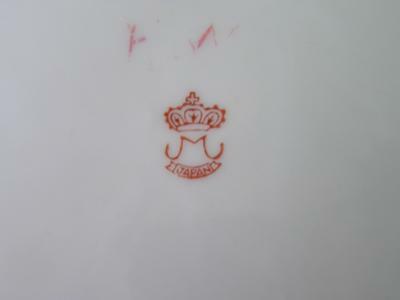 Can anyone else give a confirmation this M mark with crown is Noritake? A visitor sent in pictures of the wares, which I have added above. Many thanks for that. Always send pics of the wares too. We now have the technology to upload up to 4 photos with the original submission. You can do a certain amount of your own research online by knowing the most efficient way to search. On my China Replacement page, I show you how. 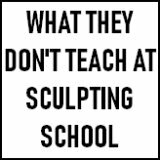 Note: Pottery marks online research is a time consuming and often thankless task. Free pottery mark online information is often limited to the websites of antique dealers who tend to have only selective information. The most thorough antiquarian online databases are private and levy a charge. Some are better than others, but a good one can often be both cost effective and time saving. Gotheborg.com - Chinese & Japanese and Far East porcelain marks - export marks are normally in English, often with English sounding patterns and brand names. I also have a teacup and saucer with the same mark, but not as distinct as one pictured here. Mine is in gold. Teacup and saucer with a lot of gold and deep burgundy, a rose inside gold lines on either side of interior of cup. I haven't found anything similar on the sites suggested to search but one indicated that in general marking with "Nippon" was before 1921, "Japan" from 1921 to 1940s, and "Made in Japan" after 1940s. I have no expertise whatsoever in this area--just curious after finding this cup among my aunt's belongings. I have a teacup with the same marking. In addition, I have two matching plates. I have been unable to identify the mark. 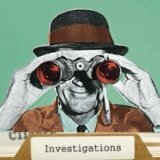 If anyone finds out I would love to know! I also have a cup and saucer from grandma that has the same markings on the bottom. Cup and saucer are white rimmed with gold and lavender painted forget me nots and green leaves. Very pretty! I have 3 shell-shaped dishes with the same mark. These dish/plates are rimmed in gold, with a beautiful set of flowers with gold stems. Would love to hear back on the ability to identify these dishes as well as others with the 'M' with Crown Japan mark. This is very likely to be Noritake ware - the 'M' stands for the founding entrepreneurs the Morimura brothers. I too have a tea set with this same mark. I was just wondering if anyone has identified it yet. I have 4, what I am assuming luncheon plates, that the tea cup sits on. Beautiful yellow roses on plates and cups and also in side cup.....same marking.....has anyone found anything out? I have a tea cup and saucer with the same mark but in gold and the cup is a deep red with a rose design in the bottom as is the saucer. I wish I knew its worth. I only paid about $3 for it at an antique store. I purchased figurine with two dancers dressed as English colonials doing perhaps the minuet. I bought it at a sale of at the death of an older woman. The mark is in blue a fancy crown with a cross on the top and the M is has shoulders on the to and kicks out at the bottom. Is this old? Based on what Peter wrote about Morimura, I found this.. I believe it was made after 1921. I have a lovely teapot and large two-handled sugar bowl with lid with the same exact hallmark - but no creamer. The piecess are decorated simply with what appears to be English flowers. Would love to have pattern name in order to find the creamer. Anyone? An appraiser stated to me that the markings are speculated to be from the Morimura Brothers. 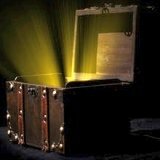 It is estimated to date in the 1930s and valued between $250-350. Apparently alot of records were destroyed in Japan during WWII so many experts are still trying to confirm the manufacturer. Hi Barbara - did you ever find out who the maker is for your piece? I have one as well. I would like to find out what it's worth . It's in excellent condition but is missing the top. Cheryl, I have two demitasse tea cups with saucers and a creamer jug with a lid that have the same pattern as your tea pot. Did you ever find a maker or design name? Its not Noritake. Their 'M' is in a laurel wreath....this is the only place ive found info on this mark. I have a full set Pot Sugar creamer and 6 demitasse cups and saucers. Cant find it anywhere! any more info?